Throughout the winter of 2017/2018, my boyfriend/hiking partner Garrett and I re-outfitted ourselves, swapping out gear items big and small to achieve a more streamlined kit, as well as a lighter pack. Five categories where I have switched things out and saved the most weight include pack, tent, sleeping bag(s), sleeping pad, and cook system. A few of these gear swaps have only been in the last few months and have not been tested out yet by me (aka pack, tent, warm weather quilt), but I’m rolling with it and feeling confident about my choices. Read on to find out what I’ve changed between 2015 and now, and how I shaved eight to ten POUNDS off my base weight…yeahhh buddyyyyy! What a goober. Let’s do this! 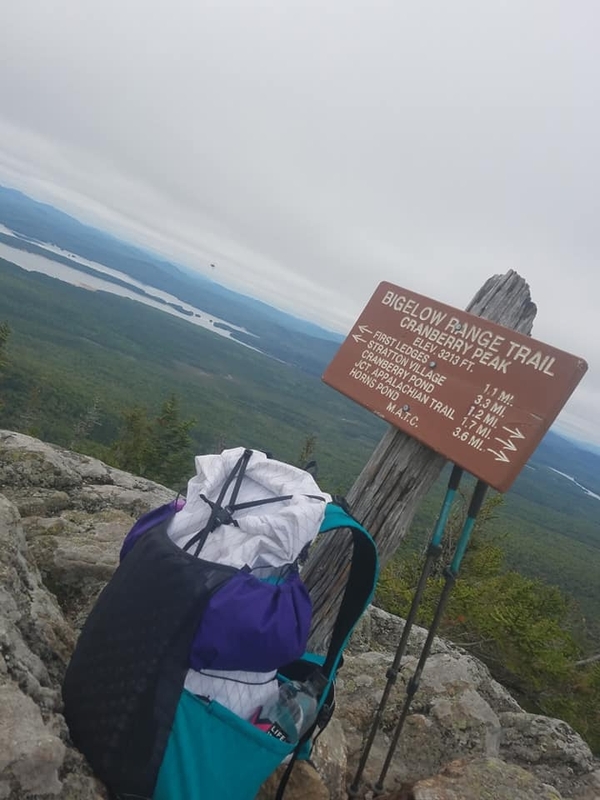 I’ve tried several packs since starting the AT in ’15 with my good ole Osprey Ariel 65L (comfy, over-sized, heavy), shifting into a Hyperlite 2400 Windrider out of desperation to cut pack weight once I flipped to Maine — this was ultimately unsuccessful as I had a hard time fitting my gear and enough food for longer stretches between resupplies, consequently overloading the thing, which made for a very uncomfortable carry. For our initial plans to hike the PCT this year, not the AT, I turned next to Superior Wilderness Designs (SWD), creating a customized Long Haul 50L. Though I have loved using this awesome pack, I feel it has more capacity than necessary for hiking the AT with the gear I have now and our plans to resupply every few days. This leads to my final decision to go for the Mountainsmith Zerk 40L – a pack that is in production currently as a result of field testing and tweaking by The Real Hiking Viking in conjunction with Mountainsmith, set to be mailed out mid-April, and I can’t wait to get my little paws on it. This is my SWD in slender day-hike form — also an over-qualified back-up in case the Zerk doesn’t work out for some reason. 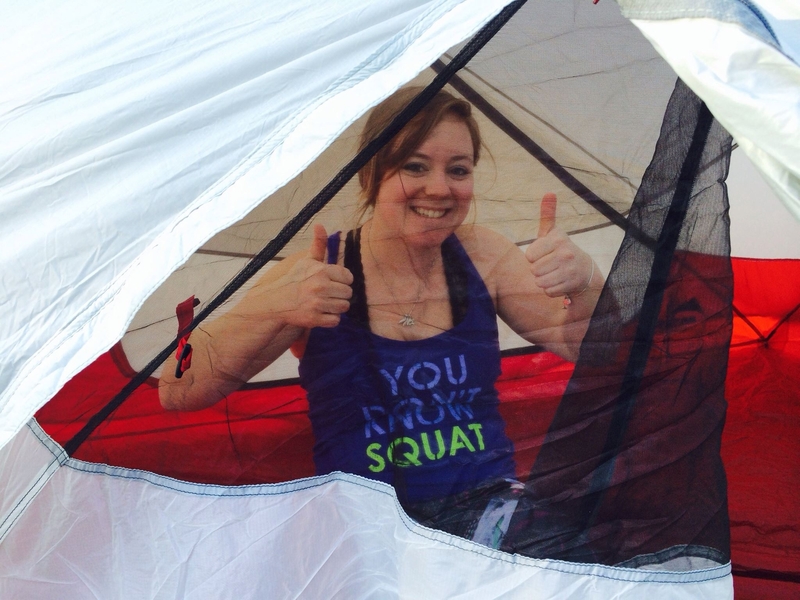 Let’s talk about tents, baby! So, in ’15 I carried the MSR Hubba Hubba NX two-person tent, which I shared with me, myself, and my gear, enjoying the extra space inside where I could explode my pack at night and do whatever I wanted, i.e. read a bit of a book and pass the F out after a long day of hiking. While researching different backpacking shelter options early on, I’d never really even considered a one-person tent — the narrow tube-like shape always seemed claustrophobic and I would rather carry the weight of a bigger tent so my stuff can live inside with me, than have to leave my gear at the mercy of the elements and critters outside at night. 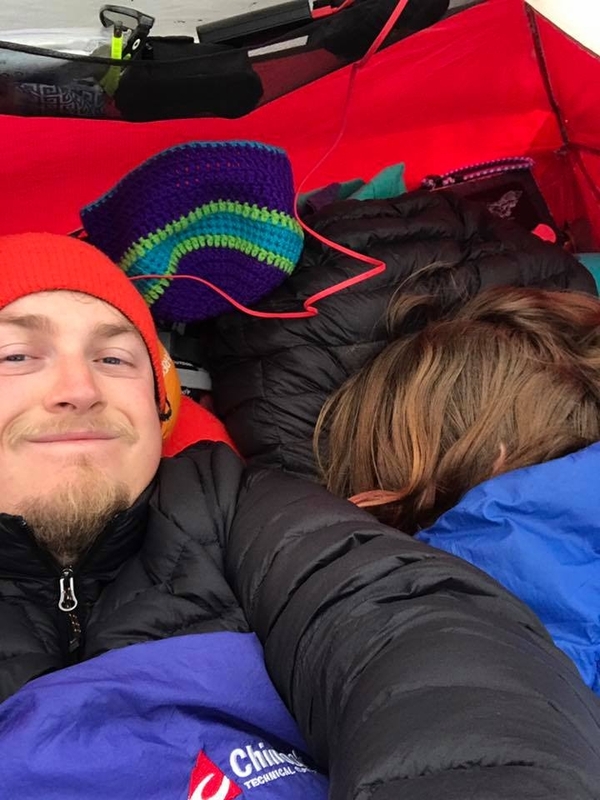 Since we began dating in 2017, Garrett and I have camped out a few times in my MSR tent, though we quickly realized space was very tight with us both set up inside, our gear shoved down at our feet and by our heads, as well as in the two vestibules. 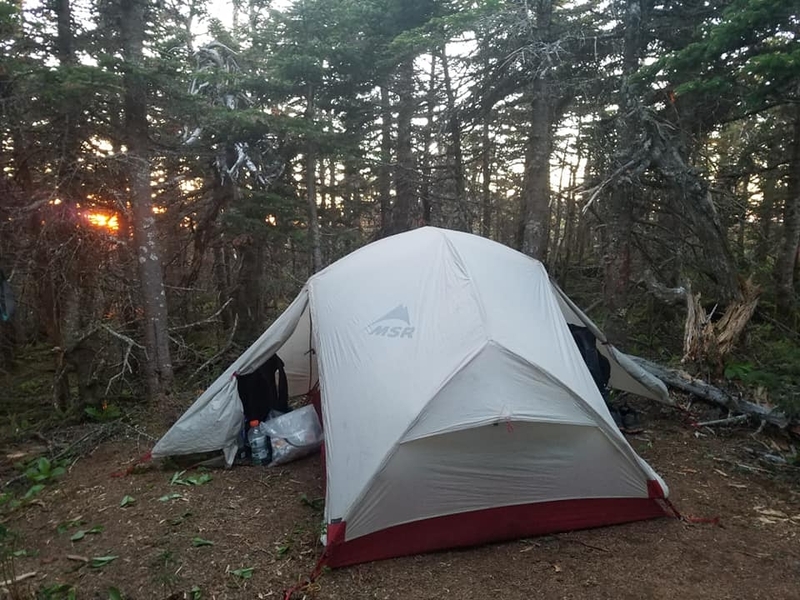 Garrett investigated some other tents, and we decided to try out the LightHeart Gear Duo, another two-person tent that weighed less my MSR and had more square footage inside, while also being reasonably priced. 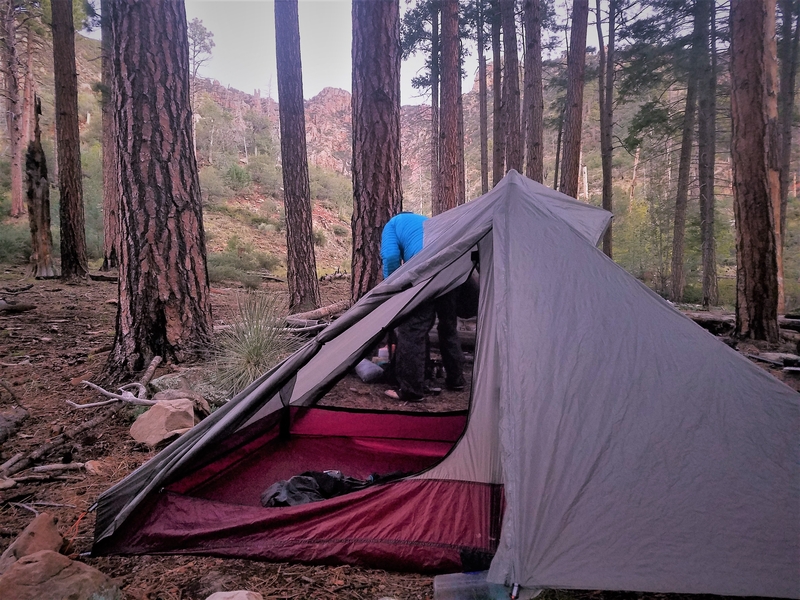 While we initially found a lot of love for the Duo and had hopes of taking it on the AT this year, a few overnights and a 40+ mile shakedown on the Arizona Trail (AZT) proved that it would not be an ideal set-up for a thru-hike with both of us and our gear tucked inside. The material of the tent, a ripstop nylon coated with silicone, tended to retain moisture making for a heavier carry and a subsequently soggy place to sleep if no opportunity to dry it out arose. Secondly, excess condensation on the interior walls became a deal-breaker when we woke up to damp down sleeping bags/quilts each morning, a big no-no since down loses its ability to retain warmth when wet. Being quite familiar with the wetness of the East coast and the AT in general, I pushed for finding another tent option that was both larger and could stand up to the rain/condensation/damp/etc., and Garrett agreed. Not today, hypothermia! Close-up of the LightHeart Duo on the Arizona Trail. This leads to our new-in-the-stuff-sack tent – the Zpacks Triplex, a freaking waterproof woods castle if I’ve ever seen one. We haven’t even been able to set this thing up yet due to the Maine tundra outside (our dirt driveway is frozen and several feet of snow border that on all sides…) but I cannot wait to get going with it on the AT! As a three-person tent it’s larger than anything we’ve used before, so we’re expecting ample space for both of us, our gear, and of course room to throw down with some rummy tournaments, ’cause we all know that’s really why hikers go to the trail for months on end. The Triplex is made of a dyneema composite fabric which is naturally waterproof and as such will shed rain and any condensation (a mesh screen between the tent walls and the bathtub floor allows any interior condensation to run down and out through the mesh instead of pooling on the floor). The last big draw for this tent, aside from the size and material, is that it only weighs 22.5 oz, or one pound, six and a half ounces, which saves us over a pound from the LightHeart Duo, and about two and a half pounds from my MSR Hubba Hubba NX. 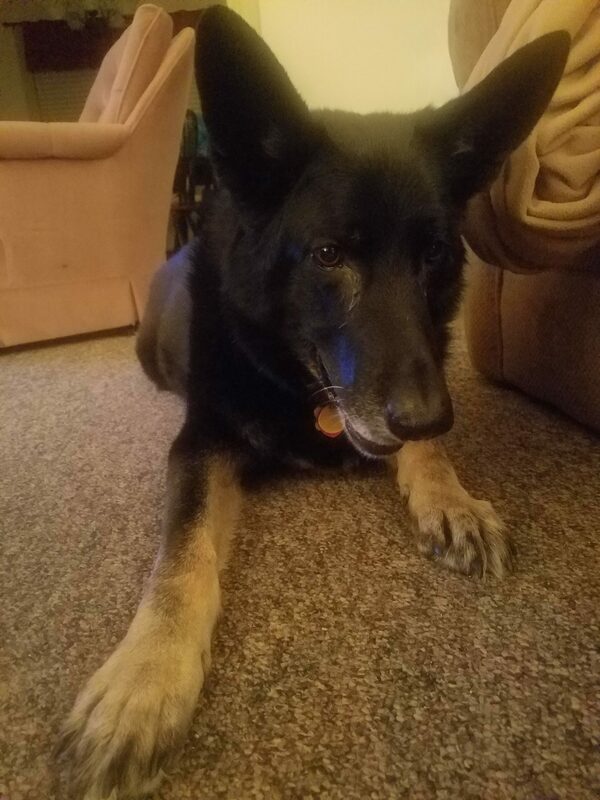 **Important financial sidenote: Garrett and I have been dog-sitting over the past year and a half for a German Shepherd named Apollo, and we’ve put aside all money raised from watching him into a separate hiking fund for joint lodging/meals/transport/etc. while on the trail. In considering the Zpacks Triplex, we struggled for a little while due to one teensy tiny detail…this tent costs $700 – HOLY SCHNIKES!! Literally, the reason we finally bit the bullet and snagged it was the fact that we had this little fund going on the side, so neither of our shabby seasonal job bank accounts took a hit. 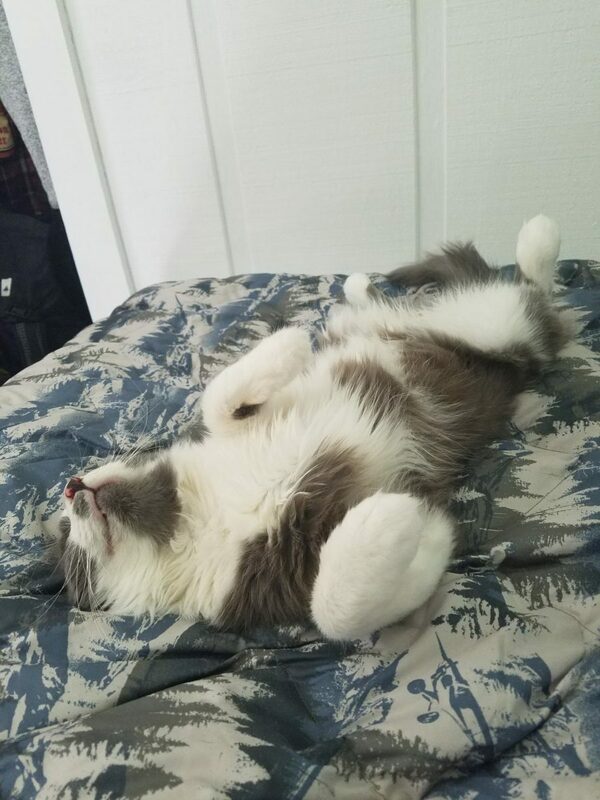 This is Apollo. Thanks for helping us out on the AT buddy! A good sleep system in the wilderness or on any camping adventure is priceless – gotta get the zzz’s to get the smiles and make the miles! I went for comfort in 2015 and settled for some items that worked for me at the time, but were not really the best option in terms of keeping up with lightweight gear on the market for years to come. I began my first backpacking and solo camping experience with a combo of the Big Agnes Q-Core SL sleeping pad and Big Agnes Lulu 15 degree synthetic bag, which had a sleeve on the back side where the sleeping pad could slide in and insulate against the ground (the bag was not insulated otherwise on the underside). I had been semi-worried about rolling off of my sleeping pad, so I thought this combo would eliminate that concern completely — it did, however when I got tired of blowing up a pad every day and tried to switch to the the Therm-a-rest Z lite Sol (a closed cell foam pad), I was cold and my hips hurt with less cushion underneath me as a side sleeper. Can you say struggle bus? During warmer months I became frustrated with the Lulu 15 degree, and in Damascus, VA snatched up a Montbell Burrow #5, a 40-ish degree synthetic bag that lightened up my base weight (a little bit) and didn’t make me sweat at night. Holy cow, anyways, I’ve learned my lesson and have returned to an insulated, inflatable pad option this time around. The Therm-a-rest Neoair X-Lite has kept me toasty on cool overnights and longer shakedown hikes, plus the women’s version weighs less than both the Q-Core SL and the Z Lite Sol. The only minor issue I have encountered has occurred while lying on my back on the Neoair – my arms tend to slide off the narrow, mummy-shaped pad built for slender females. Not a deal-breaker since I tend to either side-sleep or burrow down on my stomach when chilled, and I haven’t launched off the pad in my sleep yet…WINNING! Strapped to the Neoair pad will either be my Enlightened Equipment Enigma 10 degree quilt for colder climes, or my untested Enlightened Equipment Apex 40 degree quilt for warmer months. The Enigma has definitely taken some getting used to coming from the mummy style sleeping bag — backpacking quilts nowadays have many features you can modify, i.e. temperature ratings, down or synthetic insulation, enclosed foot box or non-enclosed foot box, etc. Quilts also tend to weigh less than traditional bags due to less overall materials – you’re not fully encased as with a bag, but rather lay underneath it like a blanket, using a sleeping pad as your insulation from the ground. I chose the Enigma primarily for its enclosed foot box, as I tend to sleep cold and my toes freeze when it’s drafty down there, yo! To similarly combat the heat loss from my head (which is outside the quilt) I’ve also added a Goosefeet Gear down balaclava for those colder nights – totally worth it as it only weighs between one and two ounces. When I initially investigated camp kitchens, I was pretty intimidated by all the variety and options out there, and I still have no desire to try out an alcohol stove or Esbit tabs. 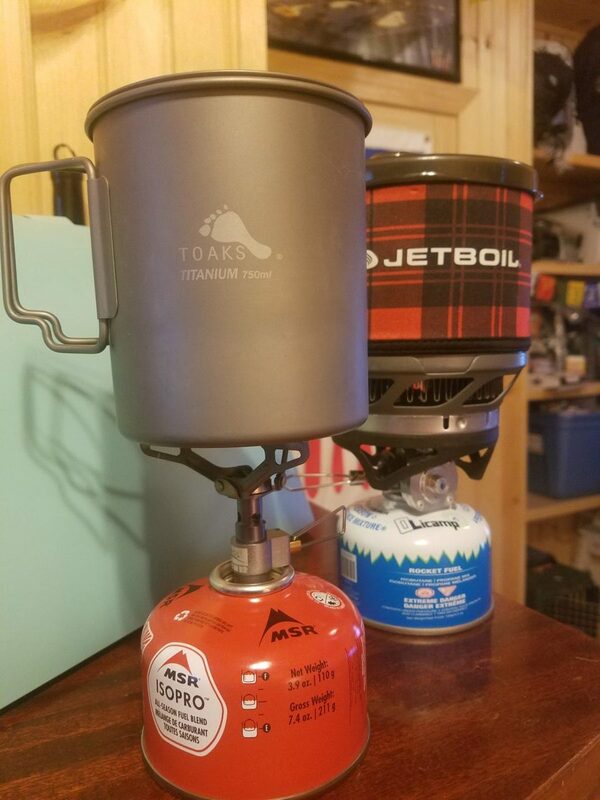 Finding happiness with a simple set-up, I went with the Jetboil MiniMo for my 2015 hike, enjoying the easy attachment of cook pot to stove to fuel canister, as well as the fast boil time and simmer option. This was an awesome little camp cooking apparatus, and I have nothing bad to say about it – only reason why I’m changing it up is the weight factor. I’ve been using a combination of the TOAKS 750mL titanium pot with the tiny BRS 3000T titanium stove and canister fuel over the last year or so without issue. The 750mL pot would be a bit on the small side for cooking meals in the pot itself, but it works perfectly for boiling the amount of water I need to re-hydrate meals in freezer bags with an insulated pouch. Totals for these five gear swaps can be seen below, and I’m super excited to see some major poundage lost with my new choices. These totals only reflect the gear I’ve mentioned above, and do not include everything else in my pack, i.e. clothing, hygiene/first aid items, electronics, food, misc., etc. My numbers below for 2019 do not include the tent, as Garrett will be carrying that on this journey. Very informative! Always looking forward to the next installment – learning a LOT!